New cleaners stop engine valve noise! Restore "quiet," smoother, "supercharged" power - guaranteed, or your money back! Engine Valve noise? If your motor sounds like its about to hammer itself apart, you need the product above from Mega Power! If left pounding in your motor, valve parts, like the 8 to 24 hydraulic lifters and cam shaft lobes - where the noise originates, will wear making it necessary for new valves, cam, and hydraulic lifter replacement. Tearing the motor apart to remove and replace those damaged parts can go from $2500 up. Instead, our method will easily end your engine valve noise and tapping, and end your worry about it, and you end up with protection famous for doubling the remaining engine life span! Many of us add the product also to our transmission - and often double its life - they just continue to run great when others - using other products and methods have to overhaul their cars and equipment - while ours continue to run just great! You want that kind of product and we have it for you! That is a secret that has help me avoid avoidable engine transmission troubles - even avoiding the sudden wear-out need to prematurely replace my them! That amounts to extra money a fewer car care worries for me! Now, I explain how you can learn about and apply this same car care secret - I'm sure many mechanics don't want you o known about. Mega Power is easy to install. Results are fast! Mega Power is easy to install. After the easy install, in a few miles of driving, the ingredients will go where oil cannot, thereby demonstrating the most effective way to free jammed valve stems, and hydraulic lifters - dissolving their buildup. Its this ability that even synthetic oil cannot provide that restores your smooth quiet motor function. Driving makes the ingredients work to clean and free your motor valves and stop the tap. The install part of the Treatment is simple. Two steps are involved, using 6 items, because that is what works. If you read this far, I'm sure this is what your motor needs. Order the Mega Power below! Item One: "a fuel system cleaner" is installed in your fuel tank. Item Two:"a valve lifter cleaner" is installed in with your motor oil. Item Three: goes into the motor air stream to clean the "combustion area" completing top side of your dirty engine valves, stopping that cause of the tapping noise. Improvement will show up as a quieter, more powerful performance. Step Two: A week later. 4. Item four: and Step 2 starts a week later by adding item #4 oil system cleaner to your motor oil for 10 minutes, then doing an oil change. 5 and 6 marked items are your motors conditioners which are added to the new motor oil. These two remaining products, "a Motor Conditioner" and 'a Engine Valve Noise" freeing agent are added to the new oil - ending the the Treatment as you again start enjoying your quiet smooth, more powerful running motor again. Order now! Get on with life and a great running car again! 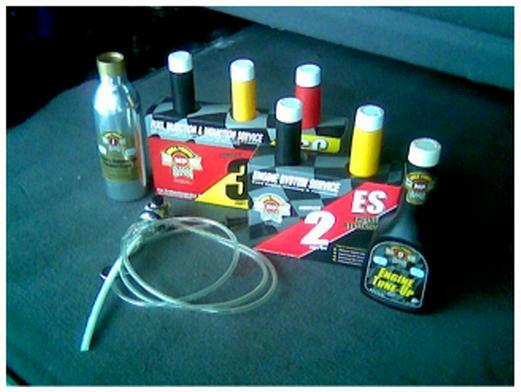 Driving continues the cleaning and conditioning to further end your problem and restore a long dependable engine life. The Step Two Part is also made for transmissions to clean and maintain its smooth shifting life. Both guaranteed! This removes loosened residues causing your valve noise problem. Mega Power Engine Valve Noise Treatment includes 6 different items needed. Each item sold separately at $29 up each! Easy to follow directions. Free phone help if needed. A $25 value. A guarantee of satisfaction. Shipped by FedEx to your door or business in about 3 days. Order One: Mega Power Engine Valve Noise Treatment. Just $80 plus $15S&h= $95 total. Order Two for both cars: 2 Mega Power Engine Valve Noise Treatments, for both cars: 2 Mega Power Engine Valve Noise Treatments. 12 items shown. Just $140 plus $15s&h= $155 total. Save $35. Protect both engine and transmission. Order one Mega Power Engine Valve Noise Treatment. Just $80 plus $15S&h= $95 total. And, One Mega Power Transmission Treatment, just $75 (9 items total). Both, just $125 +$15s&h= $140 total. Save $30. Introducing what you thought your motor oil had - but does not! The Mega Power engine Treatment. A new, fast acting treatment - easy-to-install actual engine treatment that cleans all 6 sub engine system as it frees and cleans your many engine valves - quieting the engine - doing so! How your engine problem occurs. - until Mega Power's Engine Treatment was invented. My Review. Some expert mechanics are way behind on what works. This one suggest a gooey honey like additive - when the motor already has a sticky residue problem. Research has shown, the reason no one has a sure-fire product method to do so is due to a weakness in the ingredients selected, and a weakness in the method applied. Some products sold for valves list engine-damage as a danger and side effect. Stay away from those type products! Your engine has 8 to 24 valves. Half let fuel into the piston area for combustion, and half let combustion out to your exhaust pipe. They open and close hundreds of times each minute in eye-blinking speed, operating under blow-torch heat temperatures. Heat and friction and blowby create sludge out of your motor oil and it does not take much to stick those valves. A space develops and the parts that open and close the valves bang against them creating the noise you hear. That is not good, of course. The usual fix for your car is a week with a mechanic. The $2000 "valve job," as us mechanic's refer to the fix, can now be avoided for under $100 using the Mega Power Engine Valve Treatment. Mega Power chemically and mechanically reduces engine valve noise by also reducing heat and friction - which I guarantee you will say, gives a zippy, supercharge feel. As the picture shows, Mega Power figured out what ingredient work. Something, that even part store products cold not do. Mega Power includes 3 cleans and 3 conditioners including their MC+, friction reducing anti-wear ingredient – which is able to crawl where oil cannot to clean and free the problem valves. Mega Power works as you drive toi end the tap. Mega Power offers real anti-wear advantages. Friction modifiers, listed as part of its MC+ anti-wear ingredients provide a secondary motor and budget saving benefit – that of restoring power lost from wear and teart miles driven. Customers are amazed at the stronger, quiet running, years longer lasting motor results, many customers tell us. I'm one of those. You will, too! Mega Power is easy to install. Then, in a few miles of driving, the ingredients goes where oil cannot, thereby demonstrating the most effective to free jammed valve stems, and hydraulic lifters - dissolving their buildup. Its this ability that even syntheic oil cannot provide that restores your smooth quiet motor function. Driving makes the ingredients work to clean and free your motor valves and stop the tap. One item "a fuel system cleaner," is installed in your fuel tank. A red bottle. One item "a valve lifter cleaner" is installed in with your motor oil. A black bottle. One item goes into the motor air stream to clean it and the "combustion area cleaner" to clean from that side, your dirty engine valves, stopping that cause of the tapping noise. A yellow bottle designated for such. Step Two is installed just as easily a week later, during an oil change. The remaining yellow bottle an "oil system cleaner" is added to your dirty motor oil, ten minutes before an oil change. This removes by drain out, the loosened residues causing the noise problem the above product cleaned away from your valves. The two remaining products, "a Motor Conditioner" and 'a Engine Valve Noise" freeing agent are added to the new oil - ending the treatment as you again start enjoying your again quiet, smooth, more powerful running motor. That Mega Power Engine Valve Noise stopping method is a lot faster and cheaper than an engine valve repair of thousands of dollars expense! As you can see, it is simple to install by any man or women car owner. Results are fast acting! It works as advertised, or your money refunded. Mega Power Engine Valve Noise Treatment includes 6 different items needed. Easy to follow directions. Free phone help if needed. A guarantee of satifaction. Shipped by FedEx to your door or business in about 3 days. Order One: Mega Power Engine Valve Noise Treatment. Just $85 plus $15S&h= $95 total. Order Two for both cars: 2 Mega Power Engine Valve Noise Treatments. Order Two for both cars: 2 Mega Power Engine Valve Noise Treatments. 12 items shown. Just $140 plus $15s&h= $155 total. Save $15. To order by phone, or to ask a question, call me at 512 665 3388. ...george. Our Engine Valve Noise Home Page: auto tune up and repair options.com Home Page Index list hundreds of problem solving options to save your car, equipment, avoid repairs, reduce repair expense.